Around New Year's, when other people were posting their goals for the year, I meant to post some health and fitness goals for myself. And by "New Year's", I actually mean "New Year's 2008". I think it's a little late for me to post fitness my goals for 2008, or even for 2009, so instead I'm going to grade some of the tools that have and haven't worked out. [amazon:B000KK02X0|Omron Body Fat Monitor and Scale]: B-. In addition to measuring weight, this scale also includes electrical sensors to estimate what percentage of the body are composed of muscle, fat, and other tissues. While somewhat interesting, my experience has been that the percentages change at such an excruciatingly slow rate that they're hardly worth measuring. Furthermore, although the scale measures the values down to one-tenth of a percentage point, the values fluctuate within a one percentage point range from day to day depending on the contents of my stomach, the humidity in the air, etc. The scale also calculates several other values such as resting metabolic rate and body-mass index, but these are just simple arithmetic computations based on the other values. The primary function of measuring weight works great, naturally, but the Omron Body Fat Monitor and Scale is overkill for my purposes. The Gym: C-. All the gadgets are neat for a little while, but I realized pretty quickly that anything that requires me to leave the house to exercise isn't going to last. Not when it's 100+ degrees outside. [amazon:B000A5CEUO|Omron HR-100C Heart Rate Monitor]: A+. Ever wish that you had an infallible personal couch who would tell you when you were exercising too hard or not enough? This is it. I had no idea how useful a heart rate monitor could be. 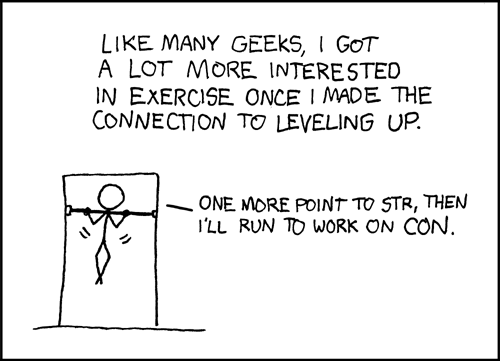 As long as I stay within my target heart rate, I find that I can keep exercising more or less indefinitely. When I exceed my target heart rate, I start to get tired quickly (physiologically, I'm exhausting the supply of oxygen in my muscles). Without a heart rate monitor, it was very easy for me to push myself to work harder, leading to exhaustion and frustration. The heart rate monitor is like a little angel that whispers "No, it's okay. You don't need to work any harder than that". For my target heart rate range, I use 50% to 85% of the way between my resting heart rate and maximum heart rate. To find my resting heart rate, I measure my heart rate when I wake up in the morning (52 beats/minute). To find my maximum heart rate, I exercise as hard as I can for around two minutes (185 beats/minute). That gives me a target heart rate range of 118 to 165 beats per minute. [amazon:B00029A7C0|Creative Fitness Door Gym]: A. 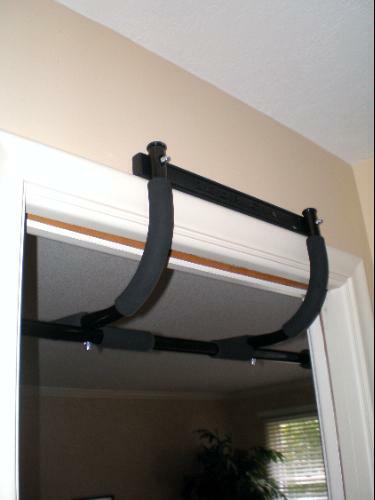 The Door Gym pull-up bar attaches to any standard door frame, without needing to be permanently installed. I love this thing. I hung mine in the door frame between the main hallway and the kitchen, and once a day or so I'll do some pull-ups when I'm walking by. I'm not sure why, but they're fun! There's just something exhilarating about pulling yourself off the ground. When I first go the Door Gym, I could perform a grand total of zero pull-ups and had to build up my upper-body strength with push-ups (which are not nearly as much fun). I'm also impressed by the engineering of the Door Gym. It transfers the force of my weight into a lateral force on the door frame. Takes all of 5 seconds to insert or remove from the door frame. Most of the time, I just leave it installed. [amazon:B0006HHI3E|Yourself! Fitness]: C+ (B with Heart Rate Monitor) I got this PC software for Alisa two Christmases ago. There are also versions available for the XBox, Playstation, and Wii (the Wii version is sold under the name "[amazon:B001H0RZX2|My Fitness Coach]"). In a nutshell, Yourself Fitness provides a virtual fitness instructor, "Maya", who guides you through a dynamically generated exercising routine. You choose a length for the workout, as well as a one of six focuses for the routine: weight loss, cardio, upper body strength, core strength, lower body strength, or flexibility. If you have an exercise ball, step bench, hand weights, or heart rate monitor, Maya will incorporate those into the exercise routine. After each group of exercises, Maya asks how well you feel you were able to perform the exercises. If you found it too easy, she'll make them harder next time, and vice versa. Overall, the workouts are pretty good and Maya provides a wide enough variety of exercises that they don't get stale quickly. I did encounter one problem with the software, though. After using a few times a week for several months, I was working my way into more vigorous routines. Unfortunately, I was advancing partially by being more fit and partially by pushing myself harder. Eventually, I was utterly exhausted after every workout and became less inclined to exercise. When I eventually got a heart rate monitor, I gave Yourself Fitness another go and realized what had happened: I could perform the workout, but my heart rate was beyond the target range. Once I scaled back the difficulty several notches, the workouts left me feeling energized instead of miserable (while remaining vigorous enough to make my muscles sore a few days later).